There are two various types of hot water cylinders installed in homes across the UK. They operate to provide hot water to your home with slight differences. Each type has its advantages and disadvantages, and this part of the article describes these. The prices for replacing the hot water cylinder will differ for each type as they are fundamentally different hot water system designs. A vented hot water cylinder system consists of a cold water tank located commonly in the loft which feeds cold water to the cylinder. The cylinder is typically situated in an airing cupboard, with the cold water feed at the bottom of the tank. Heated water rises to the top of the reservoir where it is drawn off for feeding the heating system. 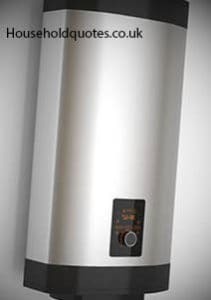 Direct heating – immersion heaters are fitted in the cylinder, and they solely provide the hot water. Alternatively, a gas boiler is connected to the system and provides the hot water to the cylinder. Commonly a boiler-heated cylinder has immersion heaters to provide redundancy. Indirect heating – a coil within the hot water cylinder is fed via the central heating system and heats the water in the cylinder. An immersion heater is also provided so that the boiler can be switched off in the summer and the cylinder takes over providing domestic hot water. A plumber will usually quote a day rate for this sort of job. A straight-forward cylinder swap should be complete within one day. The price below includes labour and secondary materials such as washers, fittings and PTFE tape. Also included is the cost of scrapping the old tank and any waste created during the job. Standard copper water cylinders are available for around £200 and a thermostat for the cylinder costs under £20. For the total job excluding the tank, you should expect your plumber to charge you around £250. If you prefer to let the plumber get on with providing everything they will need for the job then expect a quote of between £500 and £600 for the complete job. An unvented hot water cylinder connects to the mains cold water rising mains and supplies hot water at mains pressure. Similar heating methods to the vented cylinder also apply to this type of cylinder. Indirect heating, however, is not possible if you use a solid-fuel boiler to produce your hot water. Primary and secondary thermostats. The main thermostat maintains the temperature of the water below 65 degrees while the secondary switches off the heater or cuts off water supply if the temperature exceeds 90 degrees Celsius. It is possible to upgrade your hot water cylinder from a vented to a vented system, and a plumber should detail the work involved. For stainless steel, unvented, insulated and pressurised cylinder it will take two plumbers a day to complete the installation. You should expect to pay around £450 for labour, fittings and sundries excluding the cylinder. Including the cylinder, you shouldn’t pay more than £700. Depending on where you live in the UK, the hot water cylinder installation prices may vary. Replacing hot water cylinders may have disastrous consequences if not carried out professionally. Getting quotes from reputable tradesmen is vital if you are to prevent problems further down the line. A website like Rated People will allow you to verify the tradesmen’s work history before you hire them. To make things easier, you can post your job using our form and wait for the tradesmen to send their quotes. A good plumber should also provide you with some options for your heating system if you are looking at upgrading your heating.